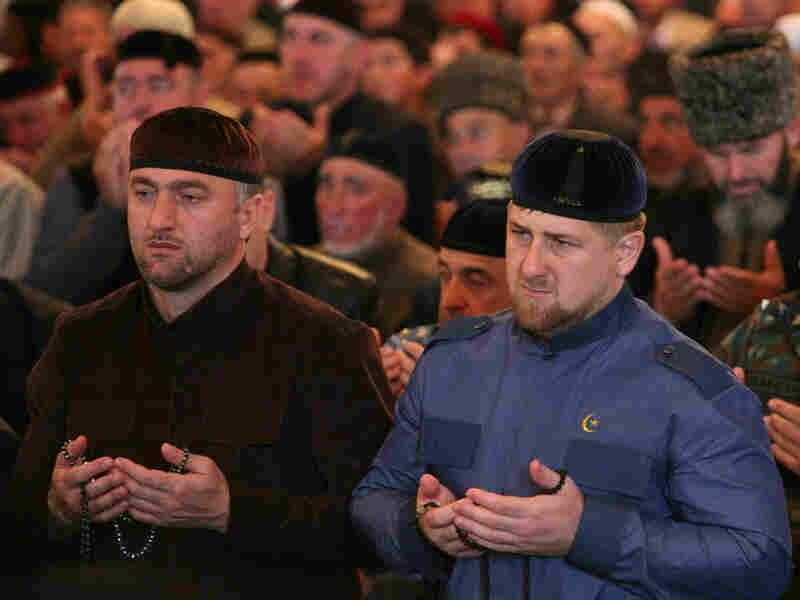 Chechen Leader's Islamic Policies Stir Unease In the war-torn Russian republic of Chechnya, Moscow-backed leader Ramzan Kadyrov has ordered the return of Sufi Islam and Chechen traditions as a way to establish control and undercut Muslim extremists. Some in the Kremlin are now beginning to ask what they have unleashed in the unstable region. Chechen leader Ramzan Kadyrov (right) and Russian parliament deputy Adam Delimkhanov pray at a mosque in Chechnya's capital, Grozny. In the war-ravaged Russian republic of Chechnya, the local government is pouring money into the construction of mosques and other Islamic institutions. Despite Russian law that declares a separation of church and state, Chechen schools must now promote Islam. There are 15 million to 20 million Muslims in Russia, and their share of the overall population of 140 million is growing. As many seek to return to their roots, the government has supported the construction of mosques and Islamic schools as long as they do not challenge the state. But in Chechnya, the Moscow-backed leader Ramzan Kadyrov has gone even further. He has ordered the return of Sufi Islam and Chechen traditions as a way to establish his control and undercut Muslim extremists. Kadyrov has ordered local officials to make sure TV companies show more programs celebrating Chechnya's Islamic identity while condemning so-called foreign Muslim trends, which he says undermine the state. The culture ministry has introduced rules for Chechen artists — all performances must conform to what it determines is Chechen mentality and upbringing. The local hit song these days is called "My Islamic Chechnya." "This is the politicization of Sufi Islam. [Kadyrov] said that the mosque has to become a political center — a center of education of the young generation," says Alexey Malashenko, a leading expert on Russian Islam at Moscow's Carnegie Endowment. "He consolidated around him the most traditional part of the society, including a piece of [the] young generation." Chechens have long battled Moscow. Soviet dictator Josef Stalin deported the entire population to Siberia and Kazakhstan during the 1940s. Those who survived harsh conditions were only allowed to return a decade later. When the Soviet Union broke apart in 1991, Chechen demands for independence resulted in two wars. The Kremlin all but destroyed Chechnya. Kadyrov, 33, was once a separatist but switched sides, recasting himself as an Islamic leader who is also loyal to Moscow. At first, his injection of national pride along with lots of money from the central government in Moscow soothed war-weary Chechens. And at first, the process of Islamization was voluntary. Any female student who wore a headscarf initially earned a prize of $1,000. Now all females, regardless of their religious convictions, must cover their heads in schools and government offices. Kadyrov has banned the sale of European-style wedding dresses in the republic's bridal salons. Polygamy is increasing. Members of the team around Kadyrov openly have several wives. Kadyrov has also supported honor killings. Lipkhan Bazaeva, who runs a nongovernmental organization promoting women's rights, says Chechnya is going back to the Middle Ages. "Yes, we are a traditional, conservative society, with our own values, but the government has gone overboard, declaring unacceptable limits on women — that they should sit at home, they should obey their husbands," she says. "As an individual, she has no rights even if her husband beats her, despite Russian laws to the contrary." She is afraid to speak out now. "If you criticize the local government, you are in danger," she says. Malashenko says Kadyrov's strong-arm tactics to unify Chechens are now dividing the society. "I spoke to young girls in Chechnya, and they don't share the idea of polygamy," he says. "They don't want to wear scarves, but they are obliged to do it. ... Those who are 40 years old, who were born in the Soviet Union, they don't want to be fanatic Muslims." There is also a split between the cities and rural Chechnya, where Kadyrov's version of Islam is more popular. Kadyrov's policies are not enough for extremists, who have recently stepped up their attacks, and they are too much for some others, including some in the Kremlin — who are beginning to ask what they have unleashed in this unstable region of the country.